During my last weekend-getaway to Las Vegas, I stopped in the town of Baker as I always do, to check out the latest stuff at Alien Fresh Jerky. I picked up this package of Teriyaki Pork jerky. Pork jerky seems to be gaining popularity lately, at least in that I'm seeing more brands carrying it. Lately, Oh Boy! Oberto released a pork jerky which I reviewed here. I don't have all the consumer demographics, but I'm guessing there's an asian population that really loves sweetened pork snacks. Alien Fresh Jerky has a website where they sell their products online, but I didn't see this pork jerky there. Maybe they'll get it on there soon. For now, you'll have to make the trek out to Baker, CA if you really need to have this. Pork, teriyaki sauce, brown sugar, water, pepper, garlic, liquid smoke, sodium nitrite. The first thing I taste from the surface of these pieces is a good deal of sweet, followed by a light garlic flavor, a light teriyaki flavor, and a light saltiness. Overall, it's a light surface flavor marked mostly by the sweet. In the chewing, I taste a stronger saltiness, a light meat flavor, with a continuation of the same sweetness. Here and there, my teeth crack into pepper piece and gives me a burst of peppery flavor. For being advertised as a teriyaki pork jerky, it seems to be light on both. The teriyaki flavor is largely represented as a sweetness. I do taste some of the unique characteristics that define teriyaki sauce, like the saltiness, along with a light soy sauce flavor, and just a faint tanginess, and something pungent, perhaps the garlic. It's actually a good teriyaki flavor. The natural meat flavor of pork is in there, but not very strong. It's just strong enough that I can get a light taste while snacking away mindlessly. The salt intensity seems to be light also. I think the heavier sweet mitigates much of the saltiness. Overall, the primary flavor you're going to taste in this is the sweetness, which starts at the surface and lasts throughout the chewing. You'll pick up a faint garlic flavor, a light saltiness, and a light pork meat flavor. I'm not sure if these are pieces of whole meat, chopped & formed, chunked & formed, or what. The larger piece depicted in the photo appears to be a whole piece, while the smaller strips are like pounded. It's a dry jerky in my opinion, but the heavier sweetness on the surface makes it feel moist. Biting off chunks from these strips seems easy to do, while chewing overall seems easy. The chewing texture for the smaller pieces depicted in the photos is rather crumbly. As I said above, I'm not sure if these are whole pieces of meat, or something else. A chunk of this jerky tends to fall apart easily in my mouth with little biting. It doesn't really chew like pork at all. Meanwhile that larger piece has a mushy texture that ends up feeling like puree'd meat. I didn't run into any chunks of fat, tendon, or gristle, and no stringy, chewy sinews. In terms of clean eating, it appears fairly clean. My fingers didn't pick up any residue from these pieces and no meat fragments fell off as I tore pieces apart. 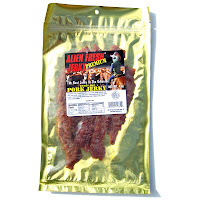 I bought this Teriyaki Pork jerky from the Alien Fresh Jerky store in Baker, CA. Each 4oz bag is priced at $8.00. However, they have a deal where you buy three bags for $20.00, and I bought six bags (each a different variety) total for $40.00. That works out to a price of $1.67 per ounce. For general jerky snacking purposes, at the $1.67 per ounce price, it seems to offer a fair value. I get a low level of snackability out of this. The teriyaki flavor seems good, but there's little else here to keep me interested, along with a strange meat consistency. But that $1.67 price is right in the ballpark with most mass-market brands. As a Teriyaki Pork jerky, at the same $1.67 price per ounce, it has a good value. 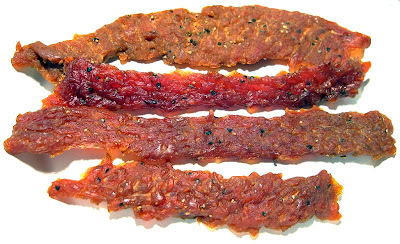 If what you specifically crave in jerky is the teriyaki flavor, you'll get a decent flavor out of this, and you'll even get a light bit of natural pork meat flavor, all at a price comparable to the mass-market brands. 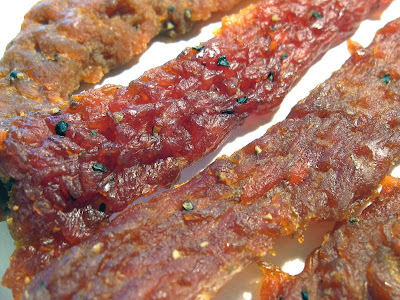 This Teriyaki Pork jerky from Alien Fresh Jerky offers a good teriyaki flavor, and even gives you a light volume of natural meat flavors. But overall, the flavor of this jerky seems rather one-dimensional with mostly that teriyaki flavor being the only dimension. The light pork meat flavor is there, but is just too light to be considered a significant flavor. There's some bits of black pepper that my teeth tend to crack into here and there, but it too is few and far between to be considered significant. The meat consistency of this is rather lackluster. I'm not sure what this is, either whole muscle, chopped & formed, or what. But what I know is that it doesn't chew like meat. It's either crumbly or mushy. But I'm giving it points because I think it lives up to its billing as a teriyaki pork jerky, and I think folks who want this specific type of jerky will get an average amount of satisfaction from it.